Upholstered items are some of the most expensive home furnishings, so it makes sense to take care of them so you can extend the life of your investment. You can rely on our professional upholstery cleaning in London to deal with your worn-out or stained furniture and make it look as just bought! We use the latest upholstery treatment techniques and also perform expert sofa cleaning that brings remarkable results. A free air mover is included as part of the service. You will extend the life of your soft textile coverings. Free maintenance advice from the upholstery cleaners. The procedure is tailored to the specifics of the fabrics. Scotchgard stain protection available upon request. Wide service coverage - operating in all London areas. You obtain a quotation for the desired service. The upholstery cleaner arrives on site carrying all needed professional solutions and machines. He takes into consideration the fabric and condition and chooses a suitable cleaning method. The technician hovers the upholstery piece and pre-treats any stains. Depending on the fabrics, hot water extraction or dry upholstery cleaning is performed. Your upholstered item is as clean as new and left to dry. The technician will examine your items to determine the material they are made of. He will also place pads under the machine. The piece is vacuumed to remove dust and other particles. Stains are pre-treated with professional solutions. Then, a tiny nozzle ejects hot pressured water. The treated area is vacuumed and nearly 95% of the water and all the dirt and allergens it has collected are extracted. Note: Air-mover will be included as part of the service to make the drying process quicker. The technician will start with an inspection to understand the type of fabrics. Then, to prepare the piece, he will pre-treat all stains. A dry solvent is applied and rubbed all over the item using a machine with spinning brushes. The dry compound method is suitable for furniture made of delicate materials. The process above can be performed with foam, instead of solvents. First, the piece is covered by a thin layer of foam, it takes about ten minutes for it to harden. Then, it is removed with a powerful vacuum machine. Your item will be dry and ready for use in an hour. The professional will spread the foam leather cleaner across your sofa or armchair. The solution absorbs all the dirt in a couple of minutes. Using a soft brush, the foam will be spread evenly while being gently rubbed onto the leather. Lastly, he wipes the surface with a cloth and applies a rejuvenator. All technicians are qualified to deal with nubuck, protected and aniline leather, they perform suede sofa cleaning, as well. If you are having troubles to remember the original colour of those items, then you certainly must take advantage of this service. You can get it separately or combined with another package. The methods used are hot water extraction and dry treatment. Also, the technicians can perform leather sofa cleaning service using products that will surely bring your item's best appearance. 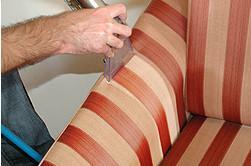 Note: Take advantage of 40% off upholstery cleaning when ordered with guaranteed move out cleaning. Combine your deep carpet clean using either hot water extraction or dry carpet cleaning with this service and opt for a discount! Cleaning the several sofas at home is the most dreadful chore for me. Thank you guys for doing it instead and always achieving amazing results. Cheers! The curtains in my husband's study were becoming dingy and smelly because of the cigar smoke. I was ready to purchase a new set but the stains came out. You saved us money. The cleaner was a little bit late, but he did a good job anyway. Calling us on 020 3746 2411. Fill in your details in the contact form below to obtain a service price estimate.